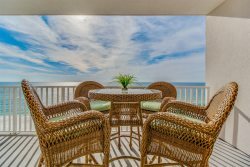 Perdido Skye, the affordable, family-friendly condo, directly on the beach with amazing Gulf front pool and deck that spans the width of the building. One bedroom, 1 bath units available. Youth-size captain's bunks built into the hallway allow extra sleeping for children. Perdido Skye has a fitness room, grilling area, and elevator. Walking distance to Villagio Shopping Village and convenient to grocery, restaurants, and attractions. A perfect family choice!